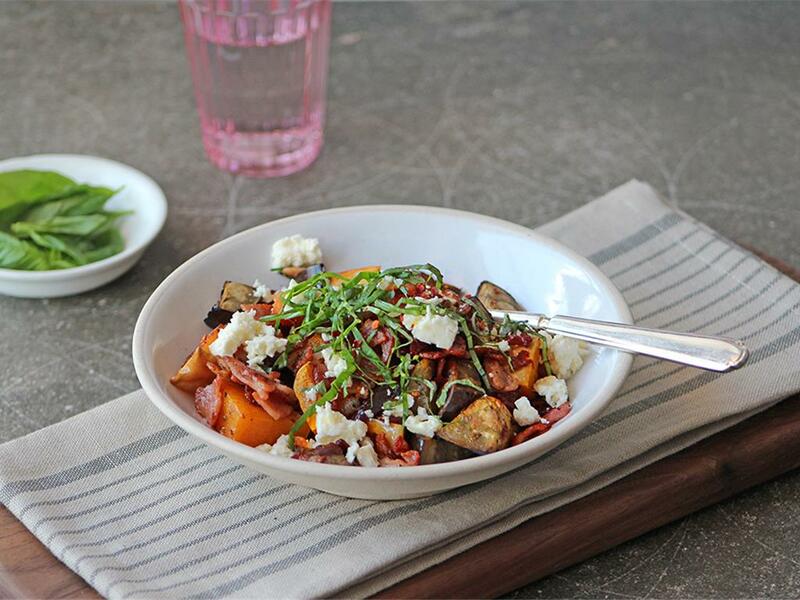 Roasted red onions, aubergines & butternut topped with crispy bacon, crumbled feta & basil. Roast veg: Place the red onions, aubergines and butternut on a tin foil lined baking tray. Drizzle with olive oil, season with salt and pepper and sprinkle with the cinnamon and chilli flakes (as much or as little as you like). Mix, arrange in a single layer and roast for 35-40 minutes until golden and cooked. Bacon bits: Place a dry pan on medium-high heat (add a drizzle of olive oil if you prefer). When hot, add the bacon and fry for 7-9 minutes until brown and crispy. If you prefer not to use olive oil, use a non-stick pan. Remove from the pan onto paper towels. Serve the roast veggies topped with the bacon bits, crumbled feta and torn basil leaves.